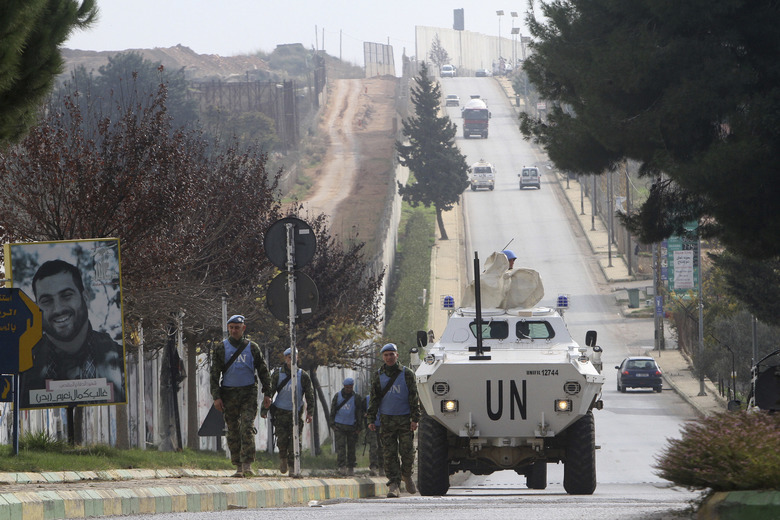 A UNIFIL patrol near the Israeli-Lebanese border. Israel asked Lebanon’s army and U.N. peacekeepers on Thursday to destroy a tunnel it said had been dug by the Hezbollah group across the border into what it called its territory. Israel’s occupation forces said this week it had identified a number of passages and sent diggers and troops close the front line with Lebanon to block them. 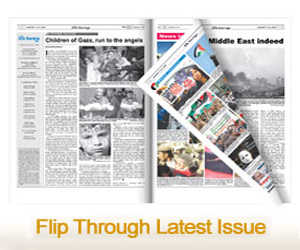 Israel said its operation would stop on its side of the border. But on Wednesday, Israeli media quoted an unnamed senior official as saying Israel could broaden its actions into Lebanon. There was no immediate reaction from Hezbollah or the Lebanese government on the U.N. statement. All parties say the situation has remained calm on both sides of the border. But the Israeli operation has focused attention on a frontier across which Israel and Hezbollah fought a war in 2006. It added that one of its commanders had showed one of the tunnels to the head of UNIFIL, Major-General Sefano Del Col.
U.N peacekeepers patrol the Lebanese side of the Lebanese-Israeli border in the southern village of Kfar Kila, Lebanon, Tuesday, Dec. 4. 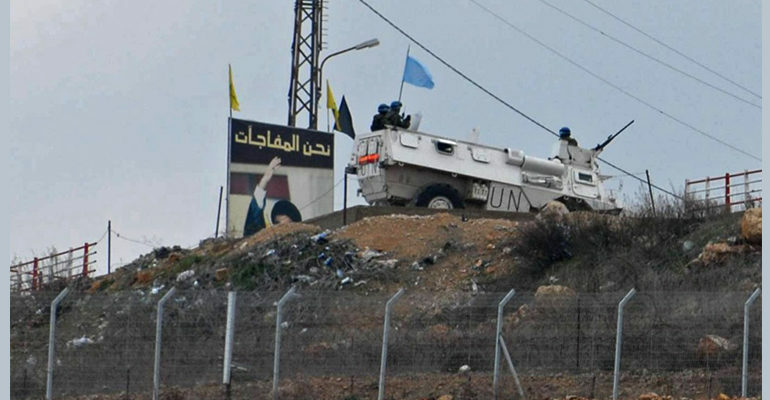 “We urge … that UNIFIL take action together with the Lebanese armed forces to clear the area, clear the access to the tunnels and make sure that it is not used for (hostile) purposes against Israel,” said Lieutenant-Colonel Jonathan Conricus, a senior military spokesman. Israeli Prime Minister Benjamin Netanyahu said this week Hezbollah was planning to send militants through the tunnels to launch attacks. He expanded on his comments on Thursday. “Hezbollah wants to insert several battalions to our territory with the aim of isolating communities, towns and kibbutzim (collective farms) to continue its reign of terror and abductions which could take place simultaneously,” he told a meeting of foreign diplomats. He said Hezbollah’s tunnels were big enough to be used by motorcycles, small vehicles and groups of people. Lebanese Foreign Minister Gebran Bassil has instructed the country’s envoy to the U.N. to complain that Israel is waging “a diplomatic and political campaign against Lebanon in preparation for attacks against it,” Hezbollah’s al-Manar TV said. Israeli Prime Minister Benjamin Netanyahu and his wife, Sara. However, the Israelis have violated Lebanese land, sea and airspace more than 1,300 times this year through November 15. Last November, Israeli jets flew over Northern Lebanon, the Bekaa Valley and the South. The violations are broken into 441 instances of spying planes/drones; military jets, 365 violations; military boats and warships, more than 224 and land intransigence into Lebanese territory, more than 196 times. On a daily basis in Southern Lebanon residents hear, if they don’t see, Israeli drones buzzing away like huge mosquitoes in the sky. On occasion they might see Israeli jets flying towards Syria, or even hear Israeli jets pounding positions on the other side of the Anti-Lebanon mountain range, another violation of sovereignty. All Lebanon can do is register its disapproval at the U.N. and call on the U.S.A. to rein in its ally, a request the Lebanese state has made twice this year and every year since the Israelis were pushed out of the South in 2000 (Interestingly, according to a source at UNIFIL, there are no cumulative figures on Israeli violations, although they probably run into the tens of thousands). One of UNIFIL’s roles, which has had its mandate renewed every six months since 1978, is to register the Israeli violations of Lebanese sovereignty. Israel can act with impunity as Lebanon lacks political weight internationally, while any forceful response by the Lebanese Army or Hezbollah in defense of its sovereignty would result in Lebanon being sent back “to the middle ages.” Sovereignty be-damned. Why now and what is Netanyahu up to? The question on the minds of Middle East analysts is why Netanyahu is moving this subject to the forefront of the region and implicitly threatening war against Lebanon. Some explain Netanyahu’s move as a smokescreen for his failing adventure in Gaza that broke his alliances with right wing allies and threatens the collapse of his government. 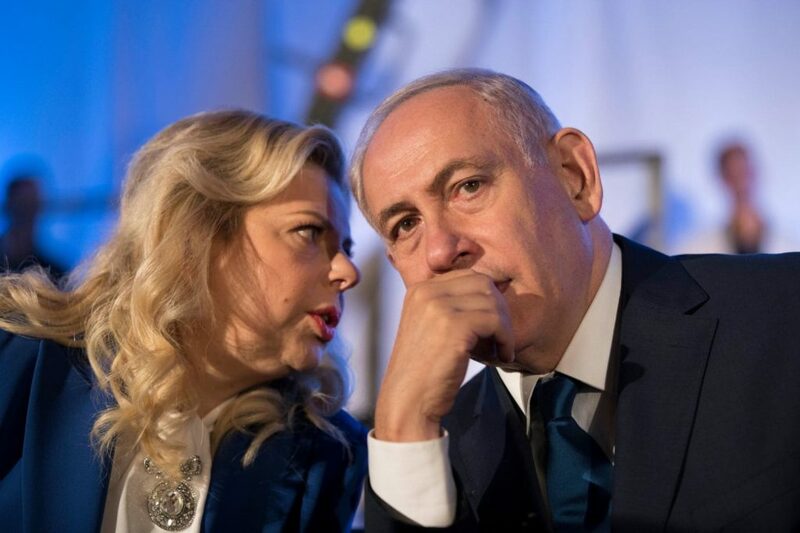 Others believe the Israeli prime minister is seeking to heighten tensions and perhaps launch a war in the region to cover up for recent Israeli police recommendation that he be charged in a third corruption and bribery case. If convicted, Netanyahu would end up in prison.